The Scroll Phone provides all current smart phone features while still providing complete mobility. When carrying around, the phone has the appearance of a rectangular screen. When in use, it can pull out a flexible OLED screen for any use. Much like a modern scroll. The flexible OLED screen is as thin and mobile as paper yet has a variety of features. The OLED screen allows media to be watched, web browsing, video calling etc. 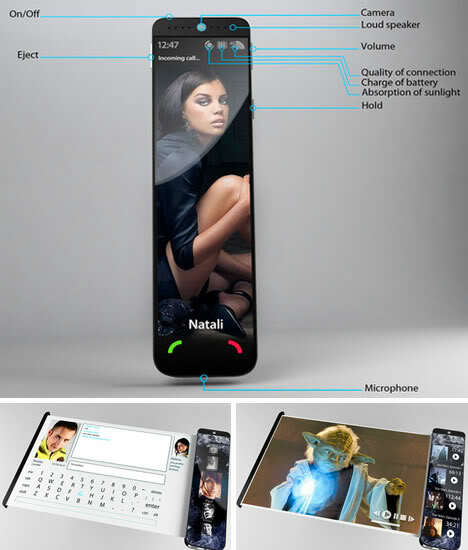 Technology like this isn’t too far off- in fact we might be seeing this phone in a couple of years.